Broncolor Siros lighting kit review and Giveaway! Karl Taylor and the Broncolor Siros Lighting set. As much as I would love to get my hands on a set of these lights, I don’t yet have a set to review myself. However, Karl Taylor from Karl Taylor Photography has been given a set of the top of the Siros range from Broncolor to test, review and to give away. 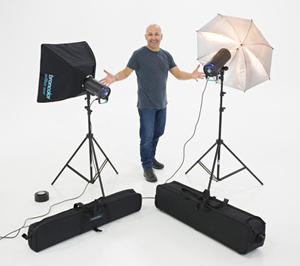 I would put these lights at the top end of the budget market and they are ideal for any professional photographer looking for a mobile setup. Karl as recorded four videos that look at what you get in the box and you get to see just how portable they are when packed away in their wheel trolley bags. Whilst many people then run a few tests on a model, Karl how us how to use the two light setup in various scenarios. He begins with a standard portrait using the kitchen area in his wonderful new studio and then they move to a more relaxed seating scenario where he compliments the natural light from a window, using the lights to fill the scene and he also moves outside. Finally, he moves upstairs into one of his new offices to show how a professional business portrait can be captured. Best of all, we all have the opportunity to win a set of these amazing lights – I guess that I’ll have to have a go then :).